As a boy growing up in Ovim (Abia State), I enjoyed one specific tradition: wake up in the morning, run to a local bakery for fresh bread, and experience enjoyment moment where tea goes with Peak Milk. I lived with Peak Milk and I grew with it. It is a peerless brand in its sector, and remains a category-king which continues to initiate a generation of young people into Peak Moments, through excellence packaged for families, as milk. So, when the opportunity came few weeks ago to visit the makers of Peak Milk, FrieslandCampina WAMCO, it was a slam dunk. For me, it was an opportunity to visit an iconic institution I had admired from afar. I had expected to see a typical industrial age company with broken doors and unpainted properties. But what I saw blew me up: FrieslandCampina WAMCO is a technology company. They just happen to be making great milk for Nigerians. But the DNA, the ecosystem, the processes and people are typical of things I see in industry-leading tech firms. For consumers in Nigeria, the Peak brand is synonymous with milk. Peak is the brand of our operating company FrieslandCampina WAMCO Nigeria, in which we work with local partners. FrieslandCampina WAMCO Nigeria sells evaporated milk and powder, and processes milk powder which is largely imported from the Netherlands. Located in the capital city Lagos, FrieslandCampina WAMCO Nigeria processes a considerable amount of milk powder. Its products ultimately find their way to consumers via an extensive distribution network and open markets. People, it was an excursion because my imagination was totally out of phase. I do not know where students of my alma mater, Federal University of Technology Owerri, go these days for tech excursion. But then, no one ever imagined that companies making milk would be as techie as I experienced. Largely, people could have missed great job opportunities by not looking wide enough. The fixation on companies that produce Likes, Share and Tweet is clouding our capacities to see beyond the clicks. I visited a space in the business which is excellently named i-Meadow. The “meadow” without the “i” is an “open, sunny area that attracts and supports flora and fauna”. And that is what i-Meadow does, except that the flora and fauna are processes and ideas. 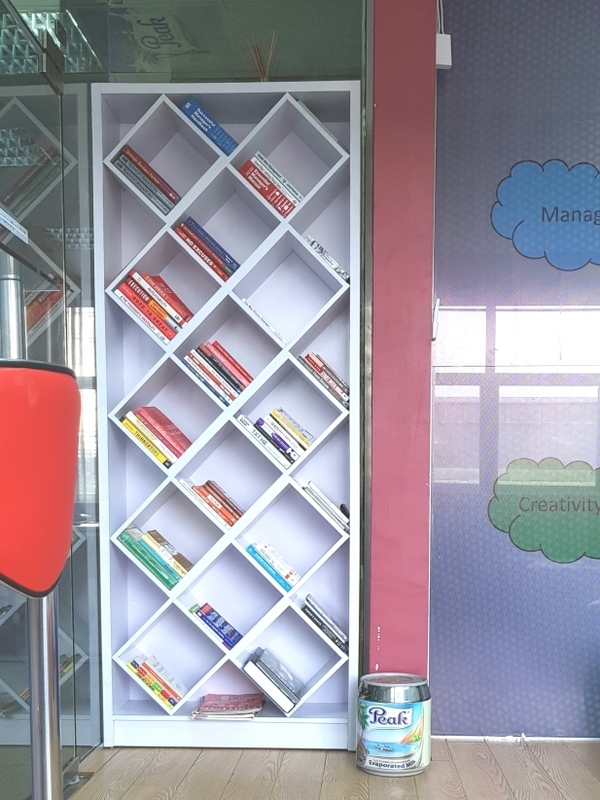 It is an innovation space where team members spend time to improve the business of dairy. They have essentially taken the playbook of the mainstream (typical) technology firms to fuse discovery and innovation within the firm. You will find in this piece photos from i-Meadow. While the energy in the space cannot be captured with pixels, you can see that the modern tech office design has gone into a building where great daily product is made. Around industrial sectors, we are seeing companies modernize their business processes and technology capabilities in order to position themselves to compete. If the business of the modern age can be won with technology, it simply means that technology is the business. Technology improves productivity, making it possible to serve customers more effectively even at lower cost. There is no doubt that FrieslandCampina has increasingly redesigned its business processes to bring the innovation capabilities that technology brings. Ecosystems like i-Meadow with top-grade and tech-inspired office design is a testament to their tradition of bringing open innovation to engineer great products. Speaking with the team, they explained a vision to position the company as a place where the brightest tech talent in Nigeria would like to seek employment. Go figure; that is coming from a dairy brand, explaining the ambition to become an innovation leader. So, if you are looking for jobs in technology companies like Jumia, Interswitch, IBM and Google, FrieslandCampina should not be far. This is a place for the techies to make careers because the business of making the best dairy product is indeed a technology business. Technology will not just have to run the production of the Peak brand but also to transform it. The following are major areas it is focusing to drive innovation. My point is that engineers and techies must expand their horizons. It does not have to be registered in Crunchbase before a company can provide real opportunities in the technology space. Your AI and data analytics skills can find home in companies like FrieslandCampina besides the typical tech firms. On the company website, it mentioned “technological breakthrough”. In other words, the business has elemental components of using technology to drive innovation and competitiveness. But this technology goes beyond just producing milk; it extends to marketing, distribution and customer engagements. From Three Crowns brand to the sachet technology, they continue to use technology to make daily products more affordable through pricing engineering, packaging and other techniques. FrieslandCampina WAMCO Nigeria sells evaporated milk and powder under the brand name Peak, which has been a symbol of quality for fifty years. Peak enjoys extensive brand awareness, and brand loyalty is also high. The Peak products contain important vitamins and nutrients and are therefore beneficial to health. The range has recently been expanded to include evaporated (liquid) milk in sachets – a technological breakthrough. FrieslandCampina i-Meadow: an open innovation space. In the technology domain, there will be emerging opportunities as technology redesigns how every aspect of business is done. The distribution system, customer engagement, and the capacity to reach users of Peak brand are areas where technology will play new roles. Whether it is artificial intelligence to aggregate data across platforms, or deepening direct engagement through social and mobile, techies will find opportunities in entities like FrieslandCampina. Extending beyond milk to On-the-go Solutions. Nigerian startup community can technically build on top of Peak to make this possible. There are many layers on top of milk and there are opportunities in those spaces. Efficient distribution of portion sizes: No one wants to visit a store only to be told that the store does not have the right size of a specific brand. So, there is a role for data analytics there by collecting data and predicting patterns to ensure customers always get the products in sizes they want. The real-time distribution insight will be critical for Peak to improve its scalable advantage and margins. The company has already invested in smaller portions but the optimality in distribution is where tech will help. Flexible packaging needs to evolve in Nigeria. Nigeria needs the squeezability and the sippability but those can come by taking Peak to another layer. Think of smoothies and yogurts. Opportunities could exist for Nigerian food entrepreneurs to work with brands like FrieslandCampina to pioneer new areas through more flexibility packaging. Data Analytics: Every business is a data business now. Firms like FrieslandCampina will provide new opportunities for data companies in Nigeria if the startups can think beyond the typical Click and Like metrics to deliver solutions that will improve key market indicators across the nation. Companies like FrieslandCampina must find ways to engage the technology ecosystem as the world looks for better ways to improve nutrition especially in children. Unlike in the past where it was impossible to track (and correlate) how nutrition was affecting children, technology like wearables and mobile could have real applications. Also, I expect more differentiation in ecommerce where hyper-focus sectors will begin to create separation in the industry. A man built an empire in U.S. by running a diaper-focused ecommerce, dairy in future should receive laser-focused distribution disruptions to reduce cost and get the products to families faster. Our limitations, as entrepreneurs, will be the scope of our visions. As I toured the firm, I saw opportunities for tech workers and startups: from logistics to direct customer engagement. Indeed, for FrieslandCampina, the industrial age is behind, the knowledge age is here.